1. This song was oríginally written by Robert Burns in Scots. It means, in English, 'old days gone by'. The music was an old Scottish tune. 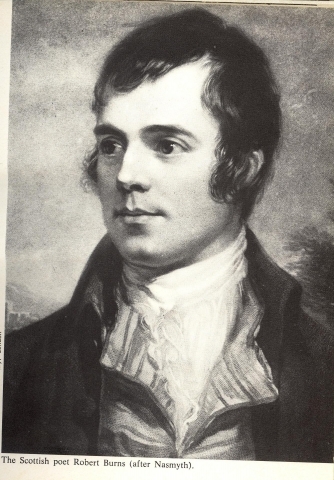 The famous poet, born in Scotland, wrote about three hundred original and traditional songs, both in the Scots dialect and in standard English. People in Britain generally sing this song on special occasions such as New Year's Eve when they gather eíther at home or in the local pubs and enjoy their glasses of whisky or beer! 3. O'thine: of thine; thine: yours (old use). The News Chronicle Song Book gives an easier alternative, 'A Smile', which may be sung to the tune of ‘Auld lang syne'. And so one smile makes two. Robert Burns, Scotland's national poet, was born in 1759 at Alloway, in a cottage which now ís a Burns museum. Robbie Burns' Night, the date of the poet's birth, is celebrated all over the world by Scotsmen. Burns had a great capacìty for love, friendship, and hearty tavern fellowship, and these attitudes provide the chief themes of his poetry. The song ‘A Red, Red Rose’ is an example of the poet's qualities. Whíle the sands of life shall run. And fare you well, my only love!